The Tampa Bay Rays finished off the San Francisco Giants in time to catch a flight to the south side of Chicago, where they will face the White Sox in a three-game series, starting Monday. For the first time in their history, the Rays have won their first three series of the season. The White Sox dropped two-of-three in a weather-shortened series against the Seattle Mariners. In spite of a miniature pitching meltdown in the middle game of the series against the Giants, the Rays took the set thanks to solid pitching and opportunistic hitting. Rays hurlers held San Francisco to a .156 batting average overall and gave up just three two-out runs. Meanwhile, the bats which averaged just 2.75 runs per game (RPG) over the first four ballgames averaged 4 RPG against San Francisco, which is not an easy feat seeing that the Giants overall ERA to start the season was sub 2.50. 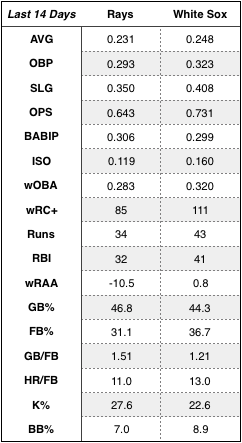 It didn’t hurt that Tampa Bay lowered its strikeout rate while increasing its wOBA, wRISP batting average, and BABIP incrementally from series-to-series. 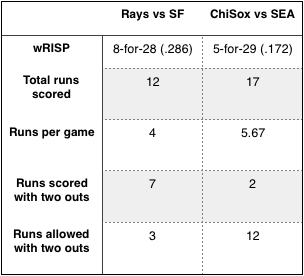 Meanwhile, after coming up with a big win against Seattle on Friday, the White Sox were drubbed by the Mariners on Saturday and Sunday The south-siders were outscored 21-7 in those two games. The pitching staff hasn’t been very good, performing to an overall 5.40 ERA/4.16 FIP — 4.70 ERA/3.73 FIP by the starters, 7.48 ERA/4.93 FIP by the relievers. Even though Chicago’s offense is better than Tampa Bays, you cannot expect to win games when you give up a bunch of runs. Blake Snell retired his first 12 batters (eight on strikeouts) before Trevor Story led off the fifth inning with a base hit. He, however, was promptly picked off by Snell. Chris Iannetta (sixth inning walk) and Story (infield hit in the seventh) went down as the only other batters to reach against the southpaw, who played off of the Rockies aggressiveness. Utilizing a similar plan to the last time he faced Colorado, Snell tied a career-high 13 strikeouts across seven innings — seven coming on his curveball. The left-hander induced 25 swings and misses (37% of the 67 strikes thrown), more than he had in any start last season. The White Sox didn’t list a probable starting pitcher for Tuesday’s home game against the Rays, although it’s likely that Ervin Santana would be the one to fill that slot. — After starting the season on a 1-for-27 skid, Willy Adames went 3-for-7 in the last two games of the series against the Giants. Mike Zunino, however, has collected just two total hits with the Rays. — Tommy Pham continued his on-base streak with Tampa Bay, reaching base five times. Pham has now reached base safely in 42 consecutive games (extending back to 2018). After a 6-4 loss to the San Francisco Giants on Saturday, the Tampa Bay Rays look to win their first road series of the season this afternoon. The six runs the Giants scored on Saturday were the most allowed by the Rays since Opening Day (5). Prior to Saturday’s contest, Tampa Bay’s bullpen had allowed just four runs in 31 innings, yet then gave up six in six frames. There is a bright side though: the Rays’ offense, which has averaged four runs per game (RPG) over the last five games, appears to be waking up. Compare that to the 2.75 RPG Tampa Bay averaged over the first four games. After being mired in a 1-for-27 stretch of frustrating at-bats, Willy Adames — who entered Saturday’s ballgame as a pinch hitter — went 2-for-3 on the day with a run scored. Adames said he hopes the showing was the start of something. I was not thinking a lot when I got to the box. I wasn’t thinking of my hands, my feet. I was just seeing the ball and hitting it. …I think I needed a day like that to get my confidence back.Hopefully keep it going (Sunday). Ji-Man Choi also had productive day at the plate, going 2-for-4 with a pair of runs batted in. All told, Tampa Bay went 3-for-7 wRISP (.429 BA) with two two-out runs. Another superlative, Jeff Samardzija — who had been incredulous at the Rays usage of openers — was knocked out of the game in the fifth inning. Perhaps, if he had an opener in front of him, Samardzija wouldn’t have had to face Austin Meadows (1-for-5), Tommy Pham (0-3, BB, run, RBI sac-fly), and Choi three times. I digress. Yonny Chirinos (1-0, 1.29 ERA) will get the start for Tampa Bay, pitching opposite of Drew Pomeranz (0-0, 3.60 ERA). Chirinos gave up one run on two hits with no walks across seven innings of a win over the Astros on Sunday. He struck out six and walked none. The lone run he relinquished came on a third-inning Jake Marisnick homer with two outs. Otherwise, the tall right-hander coaxed a ton of weak contact to pair with his strike-throwing (88 pitches, 60 strikes, 68% strike rate) which kept the Astros’ bats at bay. You can read about the series. 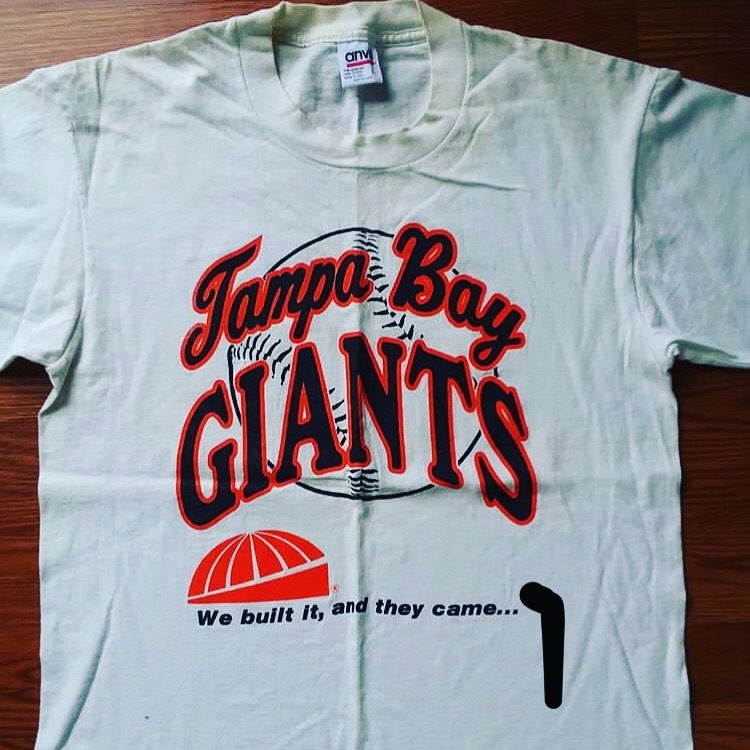 — A throwback to before the Rays were a thing, when we almost had the Giants. Let’s not take our small market team for granted. Number three starter, Tyler Glasnow, tossed six terrific innings on Friday in the first road game of the season, as the Tampa Bay Rays held on to beat the San Francisco Giants, 5-2. The Rays are off to a 6-2 start to the 2019 season. The Rays got off to a quick start, hitting a string of four consecutive extra-base hits — two doubles followed by two home runs — with two outs in the top of the first. Ji-Man Choi started the rally against Dereck Rodriguez with a double to left field. Brandon Lowe followed with a double of his own, to right field, on an 0-2 pitch, putting Tampa Bay on the board. Yandy Diaz was next, hitting a strong-man broken-bat homer (his second of the season) to left on a 1-2 pitch. Kevin Kiermaier capped the rally with a 437-foot blast to deep right-center, putting the Rays up by four. No to be outdone, The Outlaw sends one into orbit as the @RaysBaseball get back-to-back jacks in the first inning! It was The Outlaw’s second homer this season. Glasnow went to work in the bottom of the frame, with a plate appearance by the former face of the franchise, Evan Longoria, looming in the hole. The right-hander quickly disposed of the first two batters on five pitches, bringing Longoria to the plate. 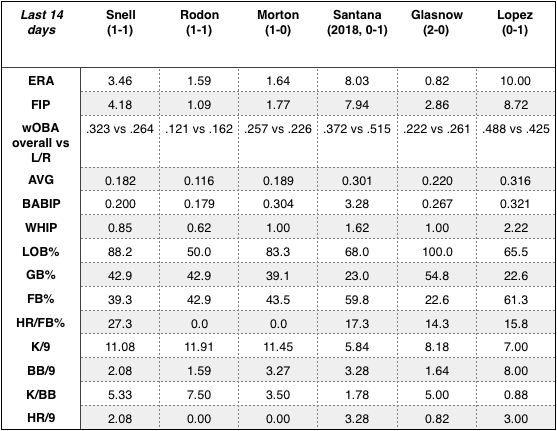 Favoring a fastball (51 thrown, 38 strikes, 6 whiffs)/curveball (25 thrown, 19 strikes, 4 whiffs) combination, Glasnow allowed runners to get into scoring position just twice across two innings. In the second, he loaded the bases with two outs, but got Rodriguez to ground to first. Then in the sixth, Glasnow struck out Brandon Crawford looking with Brandon Belt at second. The Rays tacked on a run in the seventh after Michael Perez doubled off Travis Bergen. Later that inning, Perez came around to score on Austin Meadows’ double off Nick Vincent, capping the scoring for Tampa Bay. Yet the Giants made things interesting late in the game. San Francisco plated two runs in the seventh, tagging Wilmer Font with a pair of two-out RBI doubles from pinch-hitter Pablo Sandoval and Steven Duggar. However, Rays manager Kevin Cash called on Adam Kolarek (for the left-on-left matchup), who got Belt to bounce out to short, limiting the damage. Then in the eighth, a Lowe error (the second of the day and the season for Tampa Bay), Buster Posey’s double to right, and a Crawford hit by pitch loaded the bases with none out. Kolarek caught Gerardo Parra looking for the first out of the frame before Cash called upon Diego Castillo. Four pitches later, Castillo got Kevin Pillar to ground to Robertson — who entered the game in the double switch — into a 6-4-3 twin killing, ending the threat. Finally, in the ninth, Jose Alvarado allowed what was ruled an infield hit by Joe Panik which Yandy Diaz couldn’t handle cleanly at third. Diaz dropped the ball upon the transfer, allowing Panic to reach. 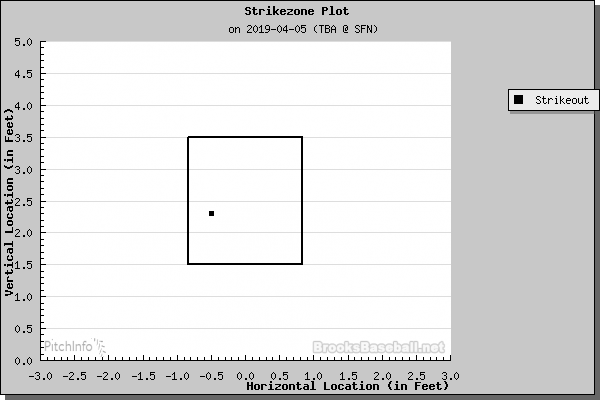 Then pinch-hitter Yangervis Solarte walked on five pitches, bringing the tying run to the plate. Duggar grounded into a fielder’s choice with Solarte forced at second for the first out, yet Duggar moved into second on a wild pitch. However, Alvarado struck out Belt for the second out, and Longoria flew out to right, ending the game with the Rays sixth “W” of the season. The Rays and Giants will play game two of three on Saturday. Tampa Bay will use an opener Ryne Stanek (0-0, 0.00 ERA), likely followed by Yonny Chirinos (1-0, 1.29 ERA), opposite right-hander Jeff Samardzija (0-0, 0.00 ERA). Yonny Chirinos gave up one run on two hits with no walks across seven innings of a win over the Astros on Sunday. He struck out six and walked none. The lone run he relinquished came on a third-inning Jake Marisnick homer with two outs. Otherwise, the tall right-hander coaxed a ton of weak contact to pair with his strike-throwing (88 pitches, 60 strikes, 68% strike rate) which kept the Astros’ bats at bay. 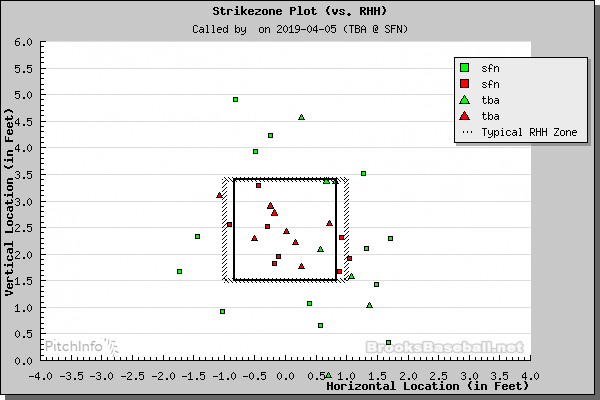 — Home plate umpire, Kerwin Danley, didn’t have the best day behind the dish yesterday. Let’s just say his strike zone was a touch liberal. Balls are green, strikes are red. — Congrats to Tommy Pham, for setting the Rays franchise record for most consecutive games on base, with 40. Johnny Damon who?